As you have probably gathered from the above synopsis, this Axis has nothing whatsoever to do with the fascistic Fifth Axis who recently featured in Big Finish's Professor Bernice Summerfield range of books and CDs. In fact, there's a comic strip flavour to the twisted reality that the Doctor (Peter Davison), Peri (Nicola Bryant) and Erimem (Caroline Morris) face here. Perhaps this should come as no surprise, since writer Simon Furman has a background in comics and TV animation. Fans may recall his work on Doctor Who Magazine's comic strip during the latter part of the Sixth Doctor's era and the beginning of the Seventh's. 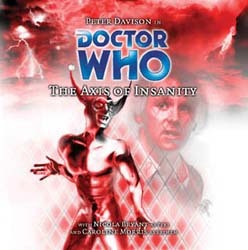 However, the bizarre funhouse goings-on with a hall of mirrors and a cackling Jester (Garrick Hagon) are more redolent of Steve Parkhouse's work, for example The Tides of Time and Once Upon a Time Lord, than Furman strips such as Nature of the Beast and A Cold Day in Hell. The Jester, as played by Garrick Hagon, is an over-the-top character, as the role demands. However, he is not particularly scary, compared to Ian Reddington's chilling Chief Clown in The Greatest Show in the Galaxy, Jack Nicholson's Joker or Michael McKean's Clown in the Star Trek: Voyager episode The Thaw. The regular cast do their usual sterling work, though at times Bryant's accent seems a little less convincing than normal, and Davison is saddled with having to talk about a device called the Milinski Multifarious... the sonic screwdriver by any other name. Once again it is Davison's Doctor who has got the first look-in following the conclusion of a Paul McGann "season" - a case of "Fly away Paul, come back Peter"? The character of Erimem is developing nicely, struggling to learn English as a written language but coping well when isolated from her companions.